Two very different takes on the chorus effect in a single pedal. TonePrint. Two distinct chorus flavours. Subtle blends. The Corona produces a nuqiue, very broad chorus. The FX level knob enables you to add the slightest touch of chorus to your sound. "If you like clear-as-a-bell sounds, the Corona won't disappoint." 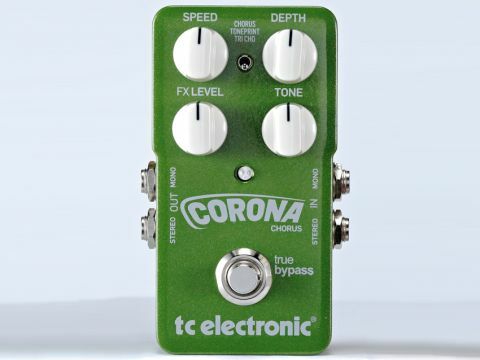 Besides its TonePrint sound, the Corona delivers a standard chorus effect inspired by the vintage TC Stereo Chorus Flanger plus a Tri Chorus, a variation of the regular chorus that uses three stereo choruses with various offsets for both depth, speed, phase and chorus delay time to produce what TC describes as a unique, very broad and lush chorus. If you like clear-as-a-bell chorus sounds, the Corona won't disappoint but, for a different chorus flavour, the Tri Chorus offers a more complex sound that's denser and more static than the standard setting. Both sound good in normal use, but also offer plenty of scope for recording a big stereo sound using both outputs. And if it's subtlety you want, the FX level knob lets you add just a tickle of chorus to your dry sound.